The YES Centre had a special visit from ‘Priscilla’ on Tuesday, February 26. Priscilla is a mobile hairdressing and beauty salon from TAFESA. 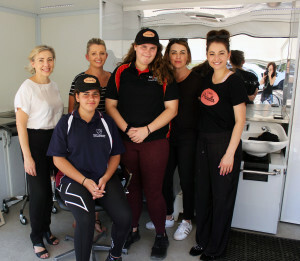 Three members of the TAFE Priscilla team showed YES hair and beauty lecturers and students through the mobile van. The purpose of the visit was to schedule future bookings as a means to engage students in their VET pathways. The mobile salon delivers hair, beauty and makeup training throughout metropolitan and regional South Australia. ‘Priscilla’ allows for flexible and demand-driven training options that meet the needs of students, schools and employers.